Stay active with a wide variety of fun, urban outdoor adventures and everything in between when you book your work-related or leisure getaway at the Comfort Suites® Little Rock West hotel in Little Rock Arkansas near Bass Pro Shops. 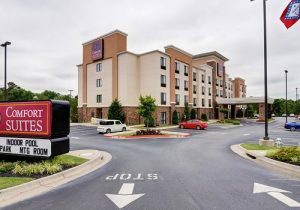 Whether you’re traveling for leisure or business, alone or with your kids, our Comfort Suites Little Rock West hotel in Little Rock Arkansas offers friendly service and a variety of complimentary amenities. Plus, you can earn rewards, including free nights and gift cards, with our Choice Privileges® Rewards program.